We always welcome new creativity! If you are interested in becoming a Member of the Toledo Craftsman's Guild, you have two options: our online jurying process (via email) or you can print, complete, and mail your information to us. We make you jump through a few hoops, but it's really no more information than what you would provide to any other juried art/craft show. If you are accepted for membership, our Jurying Chairperson will contact you with further instructions. Please note: Our Jurying process has a September 15 cutoff date. Any applications received after September 15 will be held for Jurying until the following calendar year. This gives the Jurying Committee enough time to review applications and gives newly accepted Members enough time to send in their applications to our fall shows. 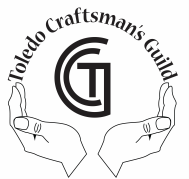 If you are thinking about applying for membership to the Toledo Craftsman's Guild, send your application in early so you don't miss out on our Fall shows! 5. Top 10 Reasons to Join!